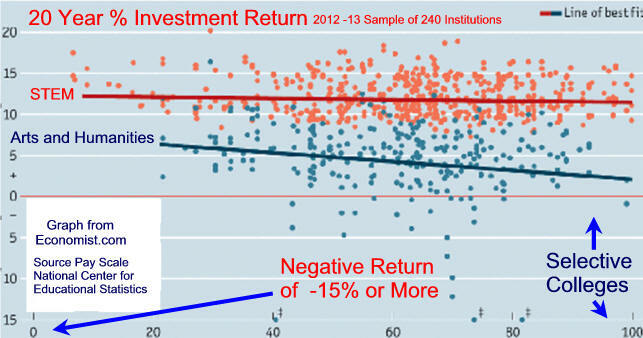 STEM Majors Have Highest Economic Return Recent Data shows STEM majors get highest salaries. Almost half the workers with bachelor's degrees in STEM fields out-earn workers non Stem Ph.D.'s according to Georgetown's Center on Education and the Workforce" "Workers with associate's degrees in STEM fields out-earn 63 percent of people who have bachelor's degrees in other fields. Current data by major data one provides data by quintile, data two is by major and degree level and data three examines high-paying two year programs. Many experts believe a better educated workforce is the best way to create high paying employment. There are two reasons education is not always the answer. 1) We can not educate average Americans to compete with very well educated, highly intelligent very ambitious people from countries such as India and Ireland. 2) We cannot educate average Americans to compete with computers. The number of countries using in-sourcing to enhance their economic well-being will grow at an ever increasing rate. Better computer will continue to replace blue and white collar workers at an ever increasing rate. We've Known Since the 1990's1 The famous Occupational study of the mid 1990"s reported a poor job market was still experienced by many college graduates 4 years after their 1993 graduation. It was only one of many indicators overcome by marketing. It reported only 62% had jobs requiring a Bachelor's degree and only 55% had jobs related to their major or had career potential. Professional degree holders did better than arts and science majors. 2015 data indicates an even more difficult time for many majors. 1Four years after graduation: The class of 1993 as published in the Occupational Outlook Quarterly of the U.S. Department of Labor, Winter of 2000-01, p 9. From a nationally representative 11,190 sample of graduating 7/92 to 6/93. Economist Paul Krugman and television personality Bill O'Rilley were on Tim Russert show last night hustling their recent books. Mr. Krugman wanted to blame the poor job creation on the Bush 2 administration and Mr. O'Rilley wanted to blame 9/11. Actually, poor job creation was caused by the outsourcing of white collar jobs made possible by the Internet and the computer finally increasing the efficiency of American workers. This process represents the most recent form of Joseph Schumpeter's, "Creative Destruction." see The World Changed and Good Jobs Disappeared. In another study, 17% of the bachelor's only graduates scored in the lowest two levels of the 1992 National Adult Literacy Survey. Economists Frederic L. Pryor of Swarthmore College and David L. Schaffer of the University of Wisconsin at Eau Clair wrote Who's Not Working and Why, an analysis of tests conducted as part of the 1992 National Adult Literacy Survey. They feel " . . . it is those college-educated workers with functional literacy little better than the average high school graduate who end up in these lower-level jobs." See Who Gets the Good Jobs and How Much They Pay for more information. Solving the problem is a college administration problem, and a student interest problem. High demand jobs tend to be more academic and require more homework. But the 2002 assessment of student attitudes and plans from UCLA's Higher Educational Research Institute show anything but an academic, homework oriented freshman class. last year's low of 34.9 percent and the 1987 high of 47 percent. 2. Less than one hour homework a week was up from 8.5 percent to 15.9 percent. 3. Interest in business careers was down to 13.8 percent from 23.9% in 1986. 4. Interest in majoring in art, music, speech, and drama was 5.8 percent. 5. Planning to work during college increased to 47.1percent from 35.3 percent in 1989. Editor's Note: First edition written in mid 2005 -2010. Return to textbooksfree.org/Professor A's Advice for Students and Parents Who is Professor A?